The Statement of Work is a document that describes a new set of deliverables and what the project will deliver and outlines at a high level all work required to complete the project. This is a useful document when you have ongoing projects under the umbrella of an existing development contract with a client and are not signing new contracts or contract change orders for every project. This Statement of Work Template is included in editable Word format that can be customized in Word or by using the included Wizard software. How do you write a Statement of Work Template document? Company Contract With will develop this project under the terms and conditions of the Software Development Agreement (SDA) executed by the parties Start Date. Company Name reserves the right to withhold all payments until all technical requirements have been demonstrated or met. A technical specification ("the Specification") outlining the proposed solution will be provided by Company Contract With and accepted by Company Name and shall be considered a deliverable to be met by Company Contract With under this agreement. All contributing developers or contactors will provide detailed invoices and have signed non-disclosure agreements prior to performing work on Company Name projects under this agreement. Description Time/Cash Allotted Insert Description Here Hours hours @ Hourly Rate/hr. 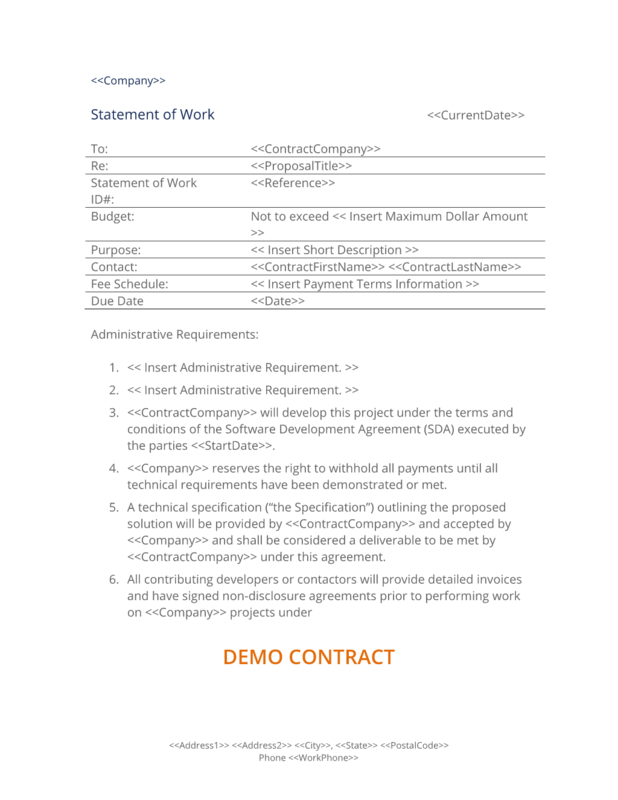 The complete Statement of Work Template - with the actual formatting and layout - is available in this Contract Pack.